(January 12, 2016) – In a recent talk with Llewellyn King — editorial board member of Boston Global Forum and host of PBS’s White House Chronicle — about situation in the South China Sea, Senator John McCain thought that the U.S needs to build up its allies in the region militarily, conduct joint exercises and provide assistance in militarization to their allies’ navies so that they will have more maritime capability, are ways to manage the situation in the region. 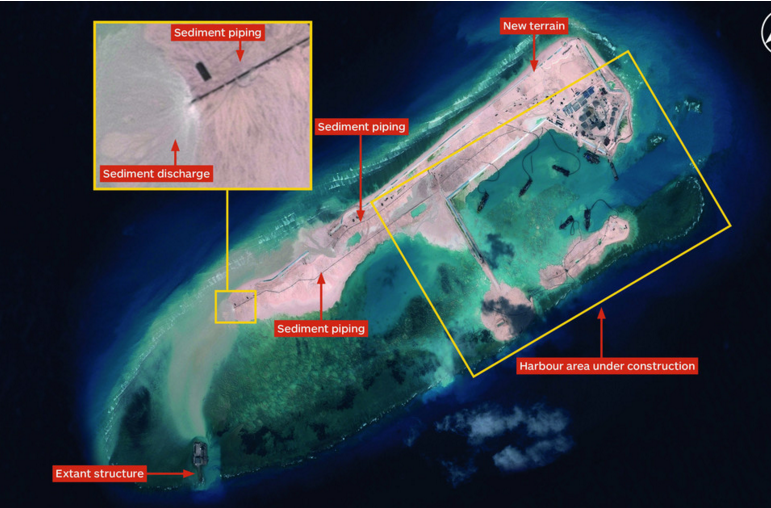 Fiery Cross Reff has been transformed into an artificial island at least 3,000 yards long that experts say is big enough to include an airstrip and could become a Chinese command and control center for military operations in the area. Photo Credit: The Wall Street Journal. 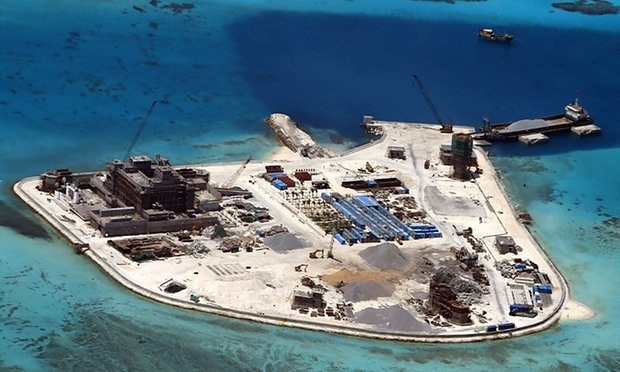 Llewellyn King: Senator, what are Chinese trying to do in the South China Sea. They appear to be stealing the whole ocean? John McCain: I think that they’re trying to realize their many centuries ambition to be the dominant force in the region. I don’t think there’s any doubt that with this latest action of theirs has been accelerated over the last couple years as you know they are asserting a violation of all international law and sovereignty in part of the world where about 60-70 percent of the world’s economy travels. I was once told by the Lee Kuan Yew, the former great pioneer leader of Singapore that the Chinese will dominate the Western Pacific and they will tell us that we can have our way in the eastern Pacific and finally they view as you know they view the last 200 years as aberrations of history and a contradiction to their many centuries old being the dominant power in Asia. Llewellyn King: There’s something fingers though about taking and at all something that is under water or water level at low tide level and building into an island and then claiming it as a sovereign territory. I’m not aware that that’s ever been pulled off by any country ever? John McCain: No. But they’re certainly getting away with it just to show you how bizarre this administration is when we finally sailed the ship within the 12 mile limit. It was widely publicized throughout the world. In the Secretary of defense appeared before the armed services committee, he was asked about that, and he said he couldn’t confirm it, so I as chairman say Why would you not confirm something that’s all over the media, why would you do that, and he kinda equivocate again. The NY Times the next day said that they didn’t want to confess Corp confirm it because it would jeopardize the climate change talks with China. I mean this is just in a really bizarre. Llewellyn King: Is their lead range we can bring to bear somewhere else in our relationship with China that caused them to back off this extraordinary act of aggression invite their neighbors to watch Vietnam, Philippines, Indonesia, all these countries that surround the South China Sea, and of course Japan if you send it into East China Sea. John McCain: Well first of all, you know, the Chinese just announced they’re going to construct another aircraft carrier, there’s no better indication of their ambition to be able to have the ability to project power and then the acquisition of an aircraft carrier. The good news is that the Chinese have alarmed their neighbors to a point where they are now coalescing with us in a way that few years ago we wouldn’t think was possible. You had the Japanese and Korean finally have resolved this comfort women issue which plagued their relationship for year. I’ve just met with Foreign minister and Defense minister of Philippines. A decision made by Philippines Supreme court which will allow them to be much more active with US military exercises, even rotational basis, maybe. A Chinese behavior united ASEAN countries in a way that years ago we would not have thought possible. And even though people the conventional wisdom and the Chinese see around the corner of history and take a long view. Well, they alienated and alarm literally every one of their neighbors, not the least of which is Vietnamese. Llewellyn King: We’ve had this rather tepid response with the freedom of navigation and as you described it, you know sort of denying it all that we’d even censorship through. Now we have a new dimension which is the aerial 10 is having its airspace violated while china say no. This is for Chinese airspace now because they have property out their way down 2010 kilometers away or something in the South China Sea. What should our response be to this? John McCain: Of course we should condemn it for what it is and by the way, the Philippines have a case before the International court concerning Chinese violations and since the Chinese have said they would disregard any verdict. I think we know what the likely verdict is, but we have to strengthen those alliances, we have to have more training, such as we have at the base in Australia where we rotate in and out, not the old conventional base with school in the hospital but rotation ends with various units which training and exercises closer relations with them and condemnation to date Chinese are sensitive to world opinion and finally, if it’s absolutely necessary then we need to look at some of our relationships with China and it is unacceptable for any nation to act in violation of international law which they did when they killed in these islands and now obviously have weaponry and have landed aircraft on it. Llewellyn King: That has multiple impacts. One of which is environmental of arron is a very sensitive areas, very margin, very important fishing area where something like a quarter of the world’s shipping parcels through the South China Sea. Is there leverage outside of Andy Lyons? Is there any leverage we can bring to bear quite separate modern dealings with China? China needs us, we will keep selling on things and buying things they make. Wouldn’t we find in some way of bringing them to heal those that were? John McCain: I think there are ways that we need to explore but I would argue the first step is to unite the countries in the region using regional forums such as ASEAN to work in a more cooperative fashion, for example, again the Philippines are going to triple their spending on defense. We are now committed to helping them acquire maritime capability in the last defense bill. We lifted any restriction on maritime military equipment from Vietnamese, so that they will have more capability. In other words there’s a lot going on… and the straps. John McCain: Vietnamese are frankly our new best friends. And that is because not only is there a threat now but they have a history with 2.000 years they were part of China, at least Chinese alleged that, so they feel particularly vulnerable and they are building up their military, and now we will be able to help them acquire maritime capabilities that they very badly need. Llewellyn King: Senator, why is China making this move? John McCain: Now, there’s a variety of reasons why china is acting now. One is perception of American weakness that what happened in the Middle East, in Syria, red line and other behavior reverberates around the world, including by the way in Ukraine. I think that they now reached a stage and militarily member done shopping have five priorities and military was the last one there now. Now they’re pursuing that fifth priority to wit the aircraft that we just saw… They are in the mode of becoming a maritime power but having being the superior force in western Pacific. There is no doubt about that. But let me also point out China’s economy is in trouble. The climate there, in Beijing, someday in can’t see a block. They’re growing older because of the one child policy. There’re a lot of challenges that China faces but I don’t think there’s any doubt that the president ruler is carrying on in the tradition of Deng Xiaoping. And I know there’s a lot of corruption in China. But a lot of person tuitions have been rather selective and those who have been indicted or even Britain prison where possible competitors to present president of China, so they are measured in there, doing things but they’re not succeeding in, I believe, doing anything but in the long run just frightening and causing reaction throughout the region and alliances that you and I would not have contemplated 10 years ago. Llewellyn King: So you think we have contained with alliances. Some people have talked about in equivalent of NATO in Asia which seems not quite fitting and a very extreme thing to do. John McCain: I don’t think that they would favor the kind of NATO member. NATO was formed when shadow of the Soviet Union was literally on your doorstep. But I do believe there’re cooperative agreements. I do believe that now you’re gonna see Japan and South Korea working very closely together. And don’t forget India. They’re now got a Prime Minister in India who is very interested in Indian sovereignty and there are areas where both Indian and Chinese interests are at loggerheads. So again, I don’t think the Chinese are going to win over time. And I don’t think they’re going to act militarily. But the reactions have solidarity among all these nations. Llewellyn King: Do you think any action we take in concert with other countries of Asia who call the Chinese to withdraw from the militarized islands. John McCain: I think joint exercises. I think assisting them with militarized their navies which some of them are very badly lagging. I think Co-corporation I think we are based in Australia that’s a model for other countries to have bases. Llewellyn King is currently is the member of Boston Global Forum’s Editorial Board and host of PBS’s White House Chronicle.